At Healthy Paws, we seek out like-minded organizations and individuals who are not only helping pets, they have a great story to share too. 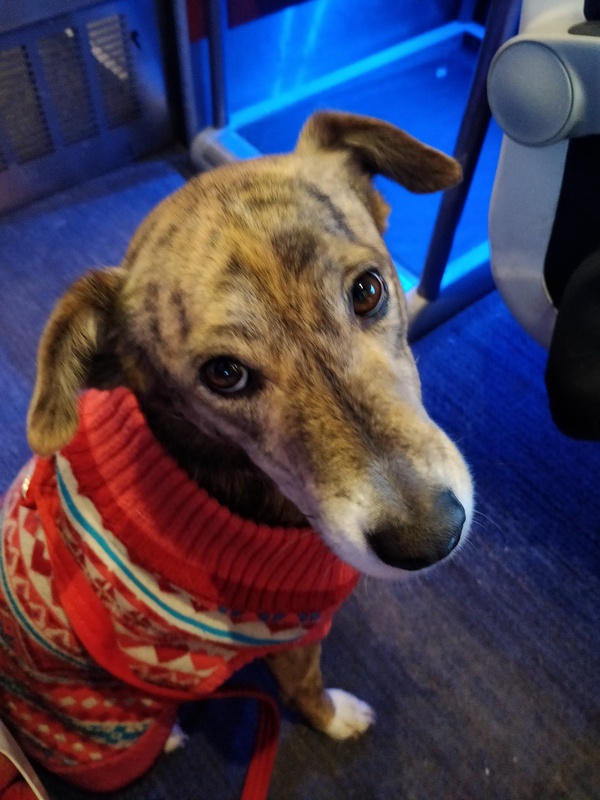 Cut to discovering Ishbel Holmes’s book, Saving Lucy, in Modern Dog Magazine a few months back – we had to know more about this person and how she rescued Lucy. After reading the book, we sent over some questions to the globe-trotting Holmes. My name is Ishbel Rose Holmes and I am Scottish, with Iranian roots too. I left the life of a professional velodrome sprinter to cycle the world solo. On my route a street dog crossed my path which would change my life forever and I wanted to tell this street dogs story and show the incredible bond between humans and dogs. A dog’s love is healing. A dog’s love is unconditional. My start to life was traumatic and I experienced foster care and homelessness before I was an adult. I wanted to die at a young age, but made the decision when I was 21 to commit myself to living. I share moments from my time when life was really bad to show to people who are suffering now that life can get better. Some of my friends committed suicide. I was so close to being one of them. Hope is so important. Love is so important. Street dogs gave me both. Healthy Paws believes strongly in the positive influence dogs and cats have on our emotional and physical wellbeing, and it seems like your bond with Lucy really demonstrated that love shared between humans and a companion animal can change lives. How do you think Lucy helped you, and how did you help her? I was so damaged from traumas as a youngster that I was incapable to love or be loved as an adult. I didn’t realise this until I fell in love for the first time and destroyed the relationship with excruciating brilliance. Love to me was rejecting the other person and making them see everything that was wrong with them just as my parents had done with me. I hadn’t learned any other way and as I set off to cycle the world on my own I had no idea a street dog would teach me everything I needed to know about love. I was cycling across Turkey, the tenth country of my world tour when a street dog I would later name Lucy was attacked by four dogs at the same time right in front of me. I was horrified that she didn’t try to run away or fight back. She just lay down and accepted what was happening to her and this broke my heart — I had been just like Lucy when I was 16 years old and in foster care and had allowed people to hurt me. I threw down my bicycle and saved her. By saving her I was saving myself. Lucy’s life as a street dog reminded me of my own when I had been alone in a dangerous world, unable to protect myself and I gave her what I never had … a hand reaching out to pull her out from the world she was in and I made it my mission to get Lucy to a life of safety. Lucy was petrified of the world around her … especially humans … and who could blame her … she had 31 shot gun pellets inside her, had suffered a broken hip, a fractured leg, one of her paws was completely destroyed and I’d later find out heartworm. I found her a sanctuary a few hundred miles away and attached a vegetable crate to the front of my bicycle to cycle her to safety. Our journey was dangerous and we had packs of wild dogs charging towards us to get to Lucy. Each time I would throw down the bicycle and would charge towards the oncoming pack screaming Lucy was not going to die today. It confused me the lengths I would go to protect this street dog when I had struggled so much to protect myself. I realised the difference was that I loved Lucy and that I had to learn how to love myself. This was alien to me as I had always hated myself and was only eleven years old when I first wanted to die. From that moment I vowed to love and care for myself as much as I loved and cared for this street dog. I copied how I was with Lucy and applied it to how I was with myself. 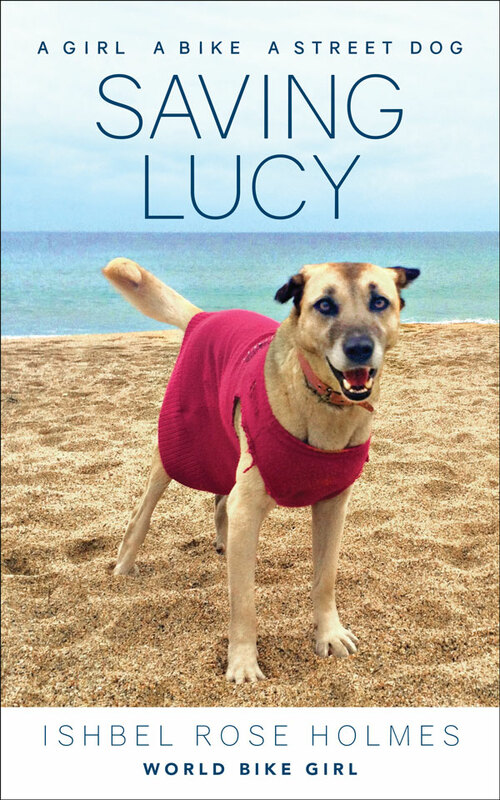 Our journey together went viral and Lucy became a famous dog in Turkey. Everywhere we went humans flocked to shower her with love and affection and tell her what a good dog she was. I watched Lucy transform as she left behind her life of fear and embraced her new life of love and compassion. I realized although I had left behind my life of suffering from my years of foster care and homelessness to become a champion velodrome sprinter and then cycling the world … I still operated from a place of fear with invisible dangers that belonged to my past. Lucy became my teacher. This street dog gave me unconditional love for the first time in my life and the affect was huge. She taught me how to love not only others but also myself. A dog’s love is unique and pure and absent of fear. A dog’s love is acceptance not rejection. The bond between human and dog is healing and transformational. How are you now? What’s new for the future – I think I spotted that you have a new pup? Yes Maria! She is one of the street dogs I rescued whilst cycling across Brazil. She was dying on the streets and only had two weeks to live when I picked her up and put her in my dog trailer attached to my bike. The bond was immediate. My life has changed so much now I had a dog. Maria has needs which I suppose are automatic needs with many humans too but I never had because of my past … such as having a home. I got us a home in Scotland! We are in the first months of home life! And we are loving it! I will still travel a part of each year but I have a home now and my life is balanced between home and travel. I’m so grateful to the street dogs. Since returning to Scotland we have cycled from London to Glasgow on a book tour. Well .. Maria sits in her dog trailer like a queen and I pedal her lol I’m totally owned by my dog ha ha ha! We have hiked the world-famous West Highland Way and bicycle toured the north coast of Scotland. Maria comes with me everywhere … I do a lot of public speaking and Maria loves the stage! Maria loves to be loved! I’m writing Maria’s book now! And hey – when’s the movie Saving Lucy coming out? Yeah amazingly a Scottish actor Fran Gilhooley wrote the movie script of my life and we are in the process of finding a production company to make it. It’s very exciting and totally unbelievable to me. I don’t know how on earth my life got so good but I’m really glad when I was 21 years old and faced with the decision to end my life or commit myself to living I chose life. Even when I was in the depths of despair and suffering something deep inside me, a tiny flicker of hope knew life could get better – I just had to hold on and keep moving forward towards things that were good for me and away from things that were bad for me. We are faced with hundreds of tiny decisions every day and my life is a reflection of the good decisions I’m making for me because I love myself. A street dog showed me the way. And I am forever grateful. 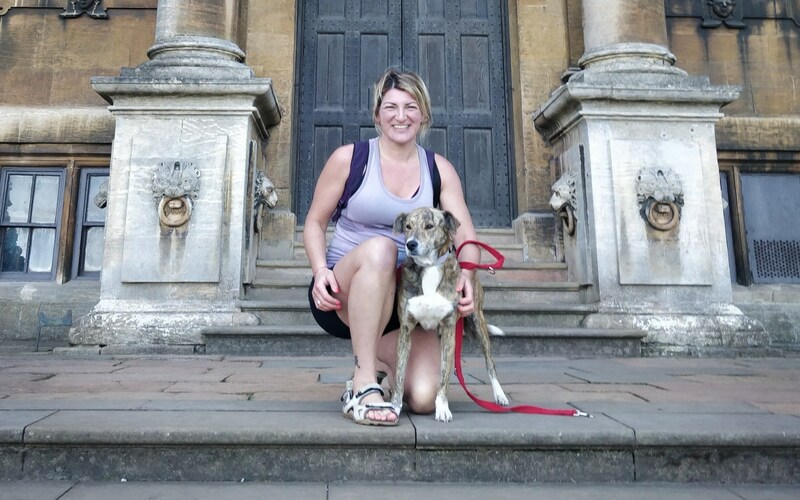 Find out more about Ishbel Holmes on her website, and check out this article about her travels with Lucy that was recently published by the BBC. If you wouldn’t be prepared to pay thousands of dollars for a pet’s unexpected accident or illness, consider enrolling in pet insurance. You can cover your furry family member and protect your wallet at the same time. Start by getting a free quote. Bonus: each quote means we donate some funds to help homeless pups get medical care and find a forever family.